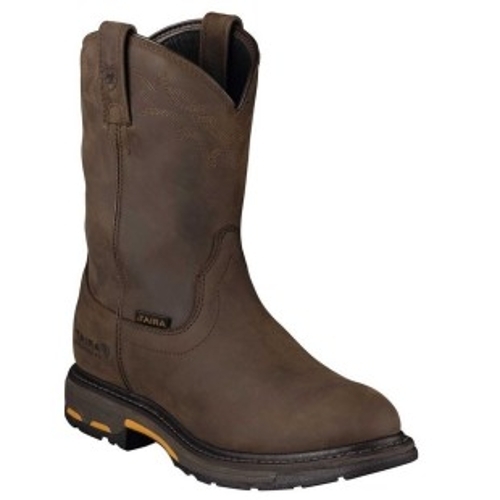 Ariat Workhog H2O 10001198 BrownAll-conditions Workhog with Western flair. Waterproof Pro shuts out the wet and snow. Ariat s ATS Max platform provides maximum torsional stability for reduction of foot fatigue and proper body alignment. The sole pairs a lightweight cushioning EVA midsole with Ariat s highly abrasion-resistant oil- and slip-resisting Duratread outsole for the ideal combination of comfort and durability. Features Ariat s unique patent-pending U-Turn Entry System allowing easy entry with a true fit regardless of foot shape.